The Audiophile Voice Celebrates Five Year Partnership! (July 16, 2007) Internet website Enjoy the Music.com and print publication The Audiophile Voice mark their first milestone in what is assured to be a longstanding and successful relationship. 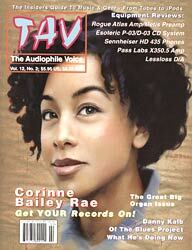 Over the past five years, Enjoy the Music.com has published the table of contents and complete editorial to each issue of The Audiophile Voice. This has brought tremendous worldwide exposure for both publications while also bringing new subscribers to the print magazine. Enjoy the Music.com continues to be the place to see and be seen within the specialty audio field. With each passing year, millions of additional people access the Internet as one of their primary ways they may receive information concerning high-end audio. Readers who enjoy our online content of The Audiophile Voice also have the opportunity to click a link and subscribe to the print magazine to further enhance their readership. Gene Pitts, Editor and Publisher of The Audiophile Voice, extends his hearty congratulations to Enjoy the Music.com and its publisher, Steven Rochlin, on their fifth anniversary of providing the web's best cross-section of articles and reviews from the country's leading magazines about audio gear and recorded music. Says Pitts, "When we started our association, I commented that Steven and I shared 'a strong common vision about the future of web and how much it will influence music distribution. A quick look at how successful Apple is with the iPod and iTunes will prove that our vision of the future was correct. I also think Steven has the proper vision of how to do a web-zine." "Partnering with The Audiophile Voice over the past five years has enabled each magazine the ability to reach out to both newcomers and well-seasoned audiophiles," says Steven R. Rochlin, editor of Enjoy the Music.com. "The Audiophile Voice is an important magazine that provides great information concerning industry events plus equipment and music reviews. Gene Pitts, editor of The Audiophile Voice, has a great vision regarding the high-end audio industry and each issue reflects that. It brings me joy to announce this prosperous partnership over the past five years and we expect it to continue for many years." The Audiophile Voice has been published by Gene's Guts & Elbow Grease Publishing Ltd. for nearly a dozen years now, and still reflects his personal credo that such a hobby magazine must be easy to read, and without any scent of the "cult of personality" or "editorial ego aggrandizement" found in too many other magazines. What's needed is straightforward, easy to understand text about an ever-expanding variety of gear and music. "For me, that's fun to provide," says Gene. "what I've been doing for nearly 40 years." If such an approach interests you, a no-commitment free issue can be obtained by e-mailing your request to audiophilevoice@verizon.net. Check out equipment reviews and articles in back issues, or take out a subscription by going to their web site www.AudiophileVoice.com. Enjoy the Music.com has been the Web’s leading information Web Site for audiophile music and equipment consumers since 1995. Over the years we have received critical acclaim from Web surfers and audio publications both on the Internet and in print. Being affiliated with three prominent print publications while also offering its own Review Magazine, Superior Audio and Classic sites -- with 100 show reports online to date -- Enjoy the Music.com has become the leading Internet authority for diverse information serving both audiophiles and music lovers worldwide. We are the only specialty audio site with its own Web browser so consumers can easily find information they desire and compare competing products. Due to such immense popularity and industry-wide respect, Enjoy the Music.com is official Internet partners with The Audiophile Voice, The Absolute Sound and The $ensible Sound.